At Oklahoma City Equine Clinic, our staff offers outstanding equine veterinary care as well as compassionate patient care for your horse. Nonetheless, we do not simply specialize in dispensing compassionate care; we apply a laser-like focus to the needs of your horse. To help with this, we constantly educate ourselves on technological and technical advancements in veterinary medicine. Dr. Carroll was raised in Weleetka, OK in Okfuskee County. He grew up working on a commercial hog and cow-calf operation. Dr. Carroll obtained his undergraduate and Doctor of Veterinary Medicine degree (1980) from Oklahoma State University. After graduation, Dr. Carroll practiced in a equine ambulatory and small animal practice in Las Vegas, NV. In 1982, he moved back to Oklahoma to practice at Equine Medical Associates in Edmond, Oklahoma. In 1990, Dr. Carroll become one of three founding partners of Oklahoma City Equine Clinic. Dr. Carroll has practiced medicine for many equine disciplines ranching from English performance to Western performance to Racetrack medicine. Currently, Dr. Carroll's focuses his time and work on advanced assisted reproduction techniques. Dr. Carroll is a member of the American Veterinary Medical Association, American Association of Equine Practitioners, Society For Theriogenology, American Quarter Horse Association, and the National Reined Cow Horse Association. Dr. Carroll and his wife, Cathi, have been married for 16 years. 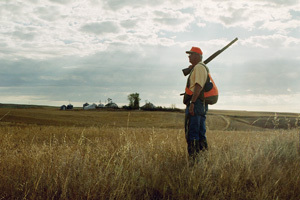 He enjoys raising and training pointing dogs, upland game hunting, raising reined cow horses, and spending time with his 3 children and 6 grandchildren. Dr. Gragg was born in Burkburnett, Texas in 1953. He was the 3rd of 3 kids. His dad operated a 50 cow dairy and was in the rodeo business. In 1958 the Gragg family moved to Edmond, Oklahoma. Farming & ranching was always a large part of their life and in 1962 his dad Ellis began a large Quarter Horse & Thoroughbred breeding farm and operated it for 27 years. Dr. Gragg learned at an early age the work ethic and commitment necessary to properly care for animals. His activities with horses began early at horse shows and progressed to the rodeo arena, where he competed in the timed events at high school and college rodeos. He attended Lamar Community College on a rodeo scholarship before returning to Oklahoma State University. Following graduation with a degree in Animal Science, he moved back home to help manage the family breeding operation for a couple of seasons before starting veterinary school in the fall of 1976. He received his D.V.M. in 1981 from Oklahoma State University. 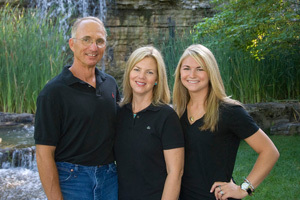 After graduation, he returned to Edmond to operate a solo equine practice from 1981 through 1989. 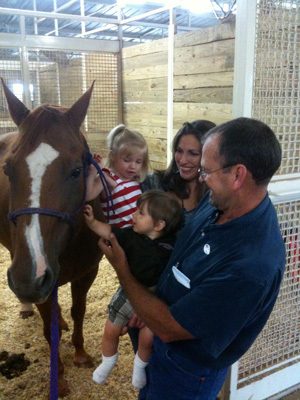 In 1990, he became a founding partner of Oklahoma City Equine Clinic. Currently, his primary area of interest is in reproduction, which not only includes mare and stallion management, but also a special emphasis on embryo transfer. In 2003, Dr. Gragg founded and became the managing partner of Embryo Transfer Services, a "sister company" of Oklahoma City Equine Clinic. In the off breeding season he still does some horse show work and manages Gragg Ranch. One of his biggest honors was serving as an executive board member of the American Association of Equine Practitioners. Dr. Gragg has been married to his wife, Jan, since 1974. They have 3 children (Jill, Deedra, and Zac) and 5 grandchildren (Dakota, Dax, Cora, Ellis, and Olivia). His hobbies include anything involving his family, whether that is a trip to the lake, to the mountains for snow skiing, or simply hanging out at home. Dr. Powers was raised in Tulsa, OK. He graduated from Oklahoma State University with his bachelor's in Animal Science in 1976 and Doctor of Veterinary Medicine in 1980. After graduation he spent one year in northern California practicing in a race horse and English performance predominate practice. Since then Dr. Powers has practiced in the Oklahoma City area with a focus in surgery; and racing and performance horse evaluation and treatment. Dr. Powers is married to Debbie a radiologic technologist at Oklahoma Heart Hospital. They have one daughter, Sarah, who graduated from Oklahoma State University with a strategic communication degree and is employed with Ackerman McQueen in Oklahoma City. In addition to veterinary medicine Dr. Powers enjoys being an instrument rated pilot, certified scuba diver, an avid water-skier, and a novice surfer. 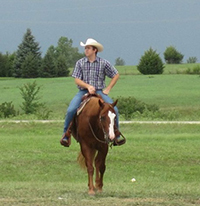 He also enjoys production agriculture with commercial cattle allowing him to be horseback often. Dr. Miles was raised in Lawrence, KS. He grew up showing horses and livestock in 4-H and local shows as well as helping with life on his family’s farm. He obtained his Bachelor’s degree from Kansas State University and received his Veterinary degree from Kansas State University in 2014. Dr. Miles completed a one year internship at Oakridge Equine Hospital before joining the staff at OCEC in the summer of 2015. Dr. Miles is a member of the American Veterinary Medical Association, and American Association of Equine Practitioners. His interests include lameness, dentistry and reproduction. He and his wife Dana are both avid horse lovers and enjoy all aspect of the horse industry from team roping and cutting to trail riding and racing. When they are not on a horse they can be found out enjoying the outdoors at the lake, on a bike or just enjoying the day on the back porch. Amanda Wilson grew up in Cheney, Kansas. Her and her family raised Corriente cattle and produced Team Ropings. Dr. Wilson and her brothers competed in rodeos growing up. She competed in breakaway roping and team roping. Dr. Wilson received her Bachelor’s and DVM degrees from Oklahoma State University. Upon graduation in 2014, she joined a mobile equine practice and in 2018 joined the team at Oklahoma City Equine. Dr. Wilson is certified in Animal Chiropractic by the International Veterinary Chiropractic Association. 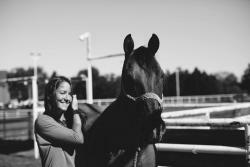 She is a member of the American Veterinary Medical Association and the American Association of Equine Practitioners. Dr. Wilson enjoys all aspects of equine medicine but her main interests include sports medicine and rehabilitation, chiropractic, and wound management. Dr. Wilson met her husband, Blake, while they were both students at OSU. Blake is an animal nutrition professor in OSU’s Animal Science department. In December 2017, their daughter Emerson was born. In their spare time, they raise commercial Angus/Hereford cattle and take care of their horses, donkey, dogs, and cats. They also enjoy attending OSU athletic events.